Here you can find our entire library of folding knife reviews. Next time you review the folder (as i said in another post) definitely check out the Ritter Grip. The main reason why I keep saying this is that its my favorite knife in production and it is an awesome value imo for what your getting. I will definitely check out the Ritter Grip. It’s a knife I have been wanting for a while now, and well, if ya twist my arm like that it looks like I will have to buy one. 😉 I just did a couple Benchmade reviews and I have a 940 up next, but I’ll definitely purchase a Ritter Grip and give it a full evaluation. Thanks so much for stopping by and leaving the excellent recommendation. Much appreciated! Thanks for the heads up Bernard! I will check him out! I just started having an interest in folding knives. I found your web site and really enjoy your reviews. I plan on purchasing the Spyderco Sage carbon fiber and will use the link from your web site. Thank you very much for the very kind comment! The Sage 1 in carbon fiber remains one of my favorite knives for every day carry and use. If you get a chance, let me know what you think once the knife arrives and you have an opportunity to check it out. I also greatly appreciate you supporting the site by going through one of my links. Thanks again!! I just wanted to add a little. I do a ton of research before buying a knife. This is an excellent place for it. I’m pretty conservative with my purchases. I’ve bought all my knives in person. Some I overpaid on but a piece of mind knowing I’m not getting a fake or sub par example. I’m thinking about getting anything else from Amazon or anywhere that has decent prices and return policy. Out of 35-40 knives, I really only regret (and I’m stretching it) buying a couple Spyderco Enduras. I’ve held the Sage 1 several times and it’s on my short list. I own a Manix 2 LW and Manix 2 LW S110V. I like them both and also plan on getting the regular G10 Manix 2. I can live with the weight on a really good knife. 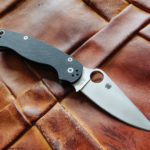 Besides the knives I already own from Spyderco-PM2s, Manix 2 LWs, Military, Enduras, Delicas, Cats, Tenacious, only the Manix G10, Sage and Dragonfly interest me. I want no part of a $240 Southard or any of the other expensive offerings. Another knife that is really underrated is the Cold Steel Code 4. Aluminum handle, large beautiful blade. Go with the Spearpoint blade. The new ones have upgraded steel from the AUS8. It’s a thin knife but wide and comfortable in hand. Another knife with little to no jimping that does not need it. I apologize for my babbling comments but hope they might help somebody out. Keep up the great reviews. You have saved me a lot of money and aggravation.